Details the Revolutionary War Battle of Rhode Island. Map of part of Rhode Island Shewing the Positions of the American & British Armies at the Seige of Newport and the subsequent Action on the 29th of August 1778. 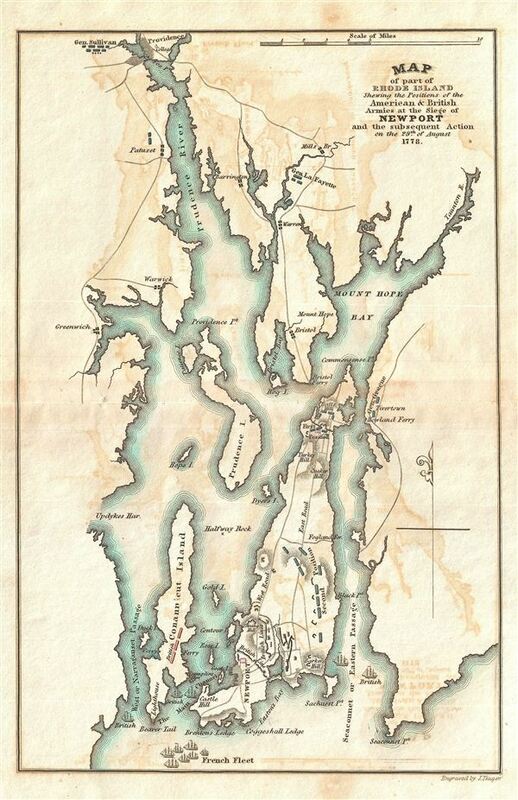 This is a rare map of Narragansett Bay, Rhode Island during the American Revolutionary War issued for John Marshall's 1832 edition of the Life of Washington. The map covers the strategically important Narragansett Bay from Newport to Providence. Various estuaries, roads, and topographical elements are noted. Color coding indicates the positions of the British (Red) and Continental (Blue) forces as each attempted to maintain control of the Bay. Marshall prepared this map to illustrate the various battles for control of Newport and Narragansett Bay during the American Revolutionary War. early in the War the city of Newport, Rhode Island and thus access to Narragansett Bay was seized by the British Major General Robert Pigot. This map illustrates attempts by the Continental forces under Major Generals Nathanael Green and Lafayette to control of the Bay. The Battle of Rhode Island (Aquidneck Island), as the siege is now known, was ultimately indecisive, with both sides claiming victory. Ultimately strategic control of the region fell to the British, who forced Continental forces to withdraw to Bristol and Tiverton while maintaining control of Aquidneck Island, Newport, and Narragansett Bay. This map appeared in atlas volume attached to the 1832 edition of John Marshall's seminal work, The Life of Washington. Marshall composed the five volume biography between 1805 and 1807 and based the work on original papers and records provided by the president's own family. The earliest partial edition of the The Life of Washington appeared in 1824 as A History of the American Colonies. In 1832 Marshall revised and abridged the original voluminous work to just two volumes and some 400 pages – from which this map was extracted. The maps of the 1832 edition are notable and desirable in that, unlike the original edition, most had hand applied color work. John Marshall (September 24, 1755 - July 6, 1835) was the longest-serving Chief Justice of the United States (1801-35). Marshall's court opinions helped establish the basis for American constitutional law and made the Supreme Court of the United States a coequal branch of government along with the legislative and executive branches. Previously, Marshall had been a leader of the Federalist Party in Virginia and served in the United States House of Representatives from 1799 to 1800. He was Secretary of State under President John Adams from 1800 to 1801. Between 1805 and 1807 Marshall published an influential five-volume biography of George Washington. Marshall's Life of Washington was based on records and papers provided to him by the late president's family. The work reflected Marshall's Federalist principles, and is frequently praised by historians for its accuracy and well-reasoned judgments. Joseph Yeager (1792-1859) was a Philadelphia based engraver active in the first half of the 19th century. Yeager was trained early on as an engraver with works appearing as early as 1808 and 1809, at just 16 years of age. By the time he reached adulthood, Yeager had become one of the top engravers in Philadelphia, where he maintained offices from 1816 to 1845. He is responsible for numerous maps and views including the map plates for Carey and Lea's American Atlas and the map plates for the 1832 edition of John Marshall's Life of Washington, and a stunning illustration of the Battle of New Orleans. Yeager also published numerous children's books and, in time, became the president of a railroad. Marshall, J., Atlas to Marshall's Life of Washington, (J. Crissy, Philadelphia) 1832. Very good. Offsetting. Original centerfold exhibits light toning. Blank on verso. Rumsey 2559.007 (1807 edition). Howes, W., U.S.iana (1650-1950): A Selective Bibliography in which are Described 11,620 Uncommon and Siginficant Books Relating to the Continental Portion of the United States, M317.